There are hundreds of reasons to “Go Vegan” even if it’s for just one day a week. Introducing vegan recipes and meal ideas into your lifestyle is a great way to be kinder to your body and to the planet. 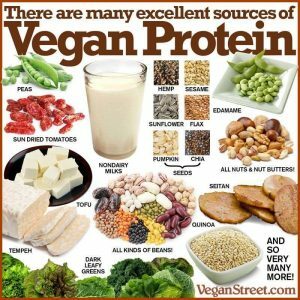 Over half a million people in the UK are now vegan and that’s because this lifestyle provides all the nutrients that you need to be healthy such as; plant protein, fibre and minerals, without all the extra nasties that are found in animal products. The yoga principle Ahimsa refers to non-harming and compassion, for many people this means leading a vegan lifestyle! So whether you’re an experienced yogi or just starting now, the practice of ahimsa can lead to a peaceful and clear mind. Here are our top 5 reasons to embrace a bit of Veganism, not only for the month, but for your life! Long term Health Goals! Vegan diets are great for your health helping to reduce your likelihood to develop heart disease, cancer and diabetes. Help the Planet! Animal agriculture contributes to 18% of greenhouse gas emissions which is more than all transport put together, veganism minimises your global footprint. Blanch the green beans in some boiling water for a maximum of 4 minutes. Drain them, refresh under cold water and set aside. They should be a glorious bright green colour. In a dry frying pan, toast the coconut on medium-high heat, watching very carefully and stirring constantly. Once the coconut begins to brown slightly and become fragrant, remove from heat—be vigilant as it can burn easily! In the same frying pan, warm up some oil and throw in the mustard seeds. Once they begin to sputter and pop throw in the shallots and cook them down for about 5-10 minutes until they’ve browned nicely. 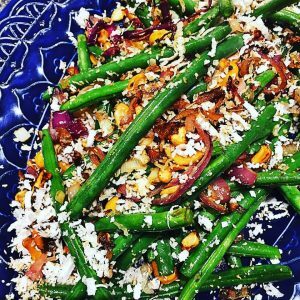 When the onions look ready, throw in the cashews, allow them to toast for a few moments and then throw in the coconut and green beans and toss everything together. Serve on a large shallow platter, season with salt and plenty of lime juice – enjoy! You can buy bags of FROZEN freshly grated coconut at CC Continental (there’s one in Harehills and another in Chapeltown) it’s a revolutionary item to have in your freezer! Here at Yoga Kula we love to cook, but we also love to go out and be social butterflies so here are our top Vegan recommendations in Leeds.